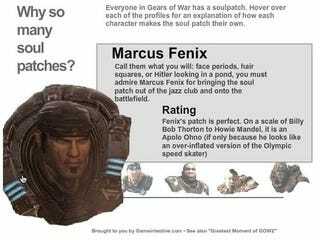 Noticed the heavies in Gears of War all sport soul patches? (Flavor savers, as we call them back in Surry County, N.C.) Here's a breakdown of the top liphair in the FPS third-person shooter genre. Game Intestine takes a look at the labia caesar (yep, that's "hairy lips" in latin) of Gears of War. But is that really a patch under Cole Train's lower lip, or just a shadow? Anyway ... I haven't been this intrigued since Luke's homage to the beards of Fallout 3.